These are excellent quality sheets, nice heft to the fabric without being too heavy. I have kept returning to Overstock to gradually purchase 6 sets. With this 3-piece Duvet Cover Set, your bedroom will feel cozy and luxurious. 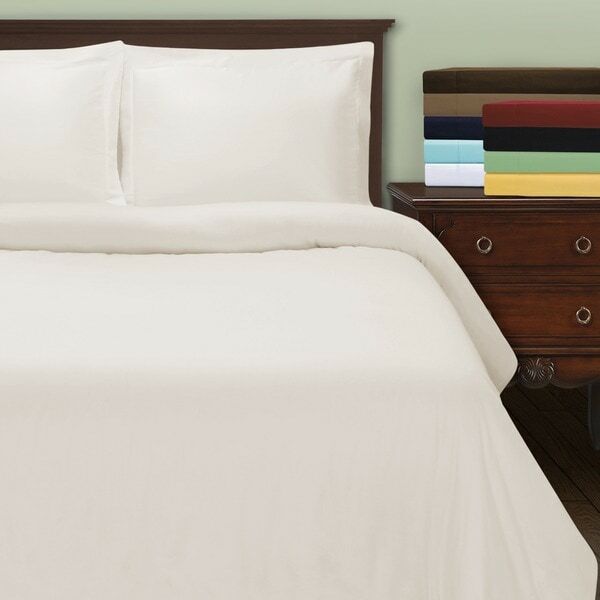 Crafted form 530 thread count Egyptian cotton, the set is comfortable, soft, and smooth. Choose from eight different colors to beautifully update your room's decor. It seems to be good quality, soft fabric; washed and dried well; fit my 88X88 inch comforter like a glove; arrived within 5 days of being ordered; has a pretty sheen to it; I ordered taupe, and while it has more gold tones in it than I expected from the picture, I'm very pleased with it. Looks great with my chocolate brown sheets. I read the reviews and should have listened... The duvet is very wrinkled and not very soft. After one wash the threading around the edges are already showing/pulling. Just because it is a high thread count does not mean its high quality and its really not that soft either. The quality of the sewing on the duvet was very poor. When I received it, there was extra thread all over it and I later discovered that was due to a slit down the side of one of the seams. So I ordered a replacement and when I took it out of the package, there was extra thread again. Upon looking at the seams, the sewing was very loose, so I just returned it. I would never purchase this product or recommend it. Duvet is as adverized, also color was as shown. I laundered duvet and shams. Since they are 100% cotton I dampened them before ironing. Shams and duvet pressed out beautifully. I'm a little OCD about pressing pillow cases and such so I couldn't resist altho for many ironing would not be necessay. I did find that pressing inhanced the softness and smoothness of the cotton. This is a heavy duvet due to the tread count but I prefer that. I am using it with a down alternative comforter with a 400 thread count which makes this combination somewhat heavy. However that is what I was looking for so I am completely satisfied. Construction is very nice. Seams are bound to limit fraying. Can't beat the price of this quality cover set; the pillow sham covers and the duvet cover all do the trick, and the quality cotton and thread count make them attractive to look at. We have had this set for about 4 months and we still love it. It is not only very soft but the color is beautiful. We have a pillow top queen size bed so we decided to go with a King. Its just a little long over the back end of the bed but perfect along the sides. I was a little concerned from a previous comment about it falling apart after washing. We did not have that problem after several washes its still very soft , the buttons did not fall off and no loose threads. Will definitely be purchasing another in a different color. Very pleased with the duvet and shams. Color just what I wanted (Navy). Not a light-weight cover, will last for a very long time! Laundered beautifully, took right out of dryer and put on. Any left over wrinkles smoothed out fast. These covers have a nice big opening at the bottom for inserting the comforter, which is much easier than other covers I have. The button closures are strong and work well. The reason I didn't give these five stars is because the cotton is slightly heavier than I had hoped for, but that means it should be sturdier too. I am very happy with the quality of this duvet cover (I got the king size in white) - it fits my king comforter perfectly and adds some nice weight to it, as it's a lighter down alternative comforter. It feels pretty soft to the touch and substantial, not flimsy, and is very comfortable to sleep under. There were a few loose threads but the stitching all looks fine, and there are a good number of buttons along the bottom edge so the comforter will stay in there securely. I had been looking for a cover like this for ages, and while plain white isn't terribly exciting it does the trick. It does wrinkle some in the dryer (even when you pull it out promptly) but not terribly and it doesn't bother me - I have better things to do with my time than iron my damn sheets! This soft duvet cover is the ONLY one I found that is long enough to fully cover both sides of our king mattress! Also, it comes out the the wash looking smooth (for cotton) and does not need ironing- even though we sometimes don't get the duvet out of the dryer promptly. Great quality - perfect. The duvet cover had an overpowering formaldehyde odor when opened. The packaging smelled so bad, I removed it from the kitchen garbage and put it in the garage garbage can. The smell filled the garage within an hour, and I had to move the garbage can into the woods until trash pick up day. After washing the sheets six times in hot water, detergent and vinegar, the smell went away. So, the good aspect of this product is that it holds up well in the wash. I am not sure that it is safe to use on a bed. The only reason I am giving this item 3 stars is because after washing once, the seaming near the buttoned opening began to unravel. There is now a hole that I need to go in and fix. I read reviews prior to purchasing and figured what were the odds of it happening to me, but it did. It is a small hole and an easy fix but still a hassle. This duvet wasn't what I was expecting - the high thread count translated into something more similar to a fleece / flannel feel. I ordered 2 twin duvet covers. I received one twin and the other package said twin, but in smaller letters said full/queen. Initially, I didn't see the small letters, so I thought they were both the same. They were not the same. They were two different sizes and two different fabric qualities. One was much thinner than the other, even though both said 530 thread count. So, I returned both, but had a problem, since they couldn't initially understand why I wanted to return both. Why don't I just exchange the one that is the wrong size? Why? Because after this experience, how can I be sure what I will receive? Will it be the right size? Will the fabric quality match the one I have? I couldn't even be sure of what I had. It was a big hassle finding boxes to put them in to return them and going to the UPS store. With having only 1 wash upon receipt, the black duvet is really rough on the skin. It is not comfortable and I do not recommend. It is worth spending the money and getting a good one! The duvet cover was nice and softat first. After the 3rd-4th wash the cover has become pilled, scratchy, and even has a tear on the seam. I will have to buy a new one. We've been very happy with this duvet set! It is soft- yet durable and was clearly very well made! We may get another! I bought this in a dark blue and I wasn't happy with how it washed. After a few washes it look worn and the sheen made it look kind of cheap. Would not purchase again. High thread count quality 100% cotton satin cover. Brown chocolate color is a deep rich beautiful hue. This thick, high qualiity duvet cover was purchased for a daybed and coordinates well in a western themed room with cowhide decor. Pleased with this Overstock purchase. Wash and dry great. Nice look and soft. Would recommend. received with wrapper in the cover. Very odd! This a beautiful duvet cover! So soft and comfortable... do be mindful that it does wrinkle after washing and drying. I just went over it quickly with an iron and it was fine. I’m pleased with this purchase. This duvet cover is luxurious. It's soft, like a cloud and easy to clean. Would certainly recommend this to anyone who is looking to add a bit of class to their room without breaking the bank. Great quality. Shipped fast and was as described. I use these at a rental property and they always hold Up Nicley. I would highly recommend to friends and family! "Will this duvet cover a comforter that measures 108x98?" The dimensions for the large are approximately 106" inches wide x 92" inches long. Given the dimensions you specified, it would not fit. It's the only high thread count non-sateen finish cotton set I could find that had bith good reviews and a manageable price. Wanted white egyptian cotton that didn't seem to have a bunch of wrinkle-resisting chemicals in it. "Is the cotton for the duvet sateen? (does the fabric have a sheen to it? If so, how much of a sheen?)" No it does not and every bit of lint, etc. sticks to it. It always looks dirty. But it is very soft. "Where does this item ship from?" Hello giselle99, This beautiful duvet cover set has received excellent reviews! We have warehouses all of the United States, so we aren't able to say where this item ships from. When you purchase this item and it ships, you will receive an email with the shipping and tracking information. I hope this helps. Thanks for shopping with us. "can I buy extra sham covers?" Hello jewette1933, This duvet set is beautiful! Unfortunately, we don't have the shams sold separately, but we do have the matching pillowcases available under item 12950946. I hope this helps. Thanks for shopping with us. "If I have a dark colored comforter, will the white duvet cover show the color underneath?" Thank you for contacting us mrsbaig. I pulled this item out of the warehouse and placed it over my black calculator :), it did change the overall look of the fabric. While I would be ok your expectations may be different. If the comforter you have is closer to black , I would try higher thread counts like sku# 11497875. Please let us know if you have any further questions. Thank you for your question chgoblond. The Egyptian Cotton 530 Thread Count 3-piece Duvet Cover Set is made in India.